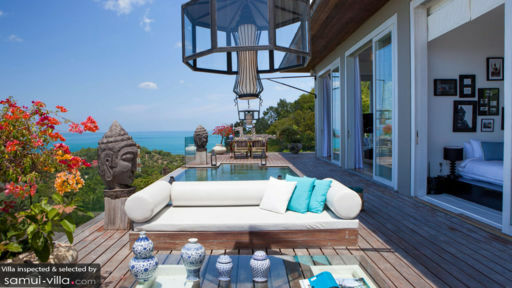 Perched atop the hills of Choeng Mon, Villa Belle comes with panoramic views out to Plai Laem Bay. The lush, emerald surroundings makes a stunning backdrop and lends a tropical vibe to the home. With three bedrooms, Villa Belle is ideally set up to accommodate small travelling parties and families. Six guests are accommodated in three well-appointed suites, all of which enjoy commanding views of the surrounding landscape. The master suite sets itself apart with its black and white décor, plush king bed and an elaborate chandelier. It extends out to include an en suite with a pod-like bathtub made of terrazzo and private wooden deck. Fitted out with an outdoor sofa and hanging Moroccan lamp, it’s the perfect spot to unwind quietly. The remaining bedrooms feature four poster beds, chill out lounges and en suites with sunken baths. Boasting a beautifully appointed outdoor space, guests at Villa Belle enjoy amenities like an infinity pool framed by a wooden deck, al fresco dining set and a cosy lounge area kitted out with a coffee table and sofas. 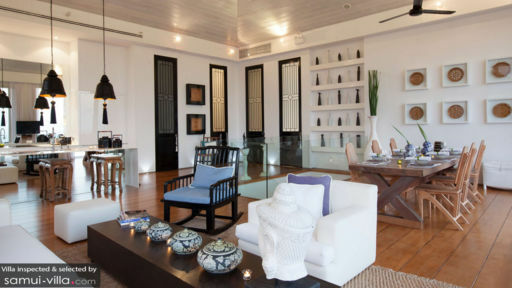 Decorative touches, like hanging lamps, floor lanterns, Buddha figurines and ornaments adds on to the ambience. Unsurprisingly, the compound is the focal point for relaxation and social gatherings. The interior of Villa Belle is best described as elegant and immaculate. A neutral colour scheme fills the common area, which complements the exquisite wood furnishings and oriental ornaments perfectly. Soft plush marshmallow white sofas, an entertainment system and movie selection completes the indoor lounge. It extends out to include a dining area furnished with an antique eight seater, which adjoins an open kitchen breakfast bar. With a villa manager, housekeeper and chef, all your holiday needs are well taken care of at Villa Belle. Your villa manager will readily assist with any requests you may have - from arranging for tours and a personal driver with car rental, to engaging trained massage therapists for in-house spa treatments. 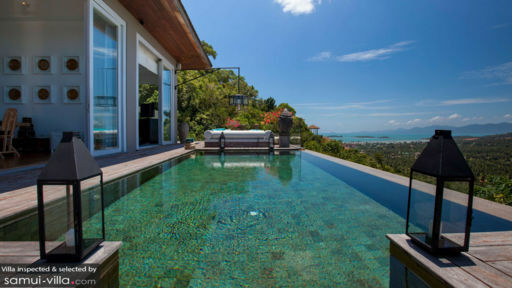 Set in the northern region of Samui, Villa Belle is a skip away from an array of local amenities and attractions. You’re four minutes’ drive from Choeng Mon Beach, a strip of white sand coast with a quieter, family-friendly ambience and shallow waters. Away from the beach, there are yoga classes at The Yogarden Samui, culinary sessions at Island Organics and ultra-luxe spa rituals at Six Senses Samui. With Villa Belle’s exceptional in-house chef, there won’t be many instances where you’ll be dining out. But when you do, high-end venues like SALA Samui Restaurant and Pangaea less than 15 minutes’ drive away. Choeng Mon’s relaxed nightlife scene doesn’t offer much options for night time revellers - the hot spots are located further south in Chaweng Beach, about 12 minutes’ drive from your villa. A more family-friendly option for the evening is Choeng Mon night market. It’s four minutes’ drive away, and is a great way to discover the local shopping and street food scene.